The film festival Viladecans three-dimensional, to be held on 13 and April 14, 2012, makes public participation basis for short film competition, whose amount is 5,000 euros in the 3D category and 3,000 euros in animation. 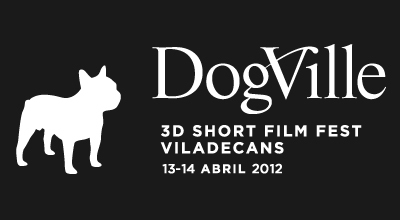 The 3D Film Festival Dogville Viladecans 2012 is ongoing. This second edition retells three distinct sections: the Dogville Pro, a space for professionals includes conferences, roundtables and networking spaces, the Dogville Kids, aimed at the younger and activities for the whole family and 3D Film Festival Dogville, the first contest of short films in three dimensions in Spain. All this accompanied by exhibits, workshops and projections. Since the bases are available for participation in 2012, this year substantially improve the amount of awards, with 5,000 euros for the winner of the independent 3D Category and 3,000 euros for Category 3D animation. The 3D Film Festival Dogville was first held in April 2011, achieving great success of public participation and recognition of the professional sector. Nearly 200 people attended the various talks Bransuela Jordi, Pauli Subirà, Josep Maria Aragonés, Pol Torrents, Gustavo Castellanos, Francisco Torrano and Jordi Llompart. For its part, the projection of 3D musical "Geronimo Stilton" in the Dogville Kids sold out more than 800 seats available in Atrium Viladecans, and finalists marathon exceeded 400 people. Last year's winners were "Error 0036" in paragraph professional, a film directed by and starring Raul Fernandez Paco León. The award for best animated short went to "Friday Night Tights" from Joonki Park, and the experimental film "Deconstruct" from Tina Braun received a special mention. Will soon be updated www.dogvillefestival.com Festival website where you can find detailed information of Dogville 2012.